Casa Vieja Lodge is pleased to announce an expanded relationship with The Billfish Foundation (TBF), the world’s premier billfish conservation group as a Official Tag and Release Program Sponsor. The Billfish Foundation (TBF) has honored Casa Vieja Lodge in the past with multiple Top Tagging awards, both for captains and anglers. The sponsorship is a natural extension of a long-time relationship between the two as we have been a long time supporter of The Billfish Foundation as our captains and crew have been providing priceless data to TBF since conception. The Billfish Foundation (TBF) is a not-for-profit 501(c)(3) organization works worldwide to advance the conservation of billfish and associated species to improve the health of oceans and economies. The cornerstone of TBF’s conservation and advocacy efforts is TBF’s Tag and Release Program, established in 1990, is now the largest private billfish tagging database in the world, and is providing the sound science needed to influence policy. 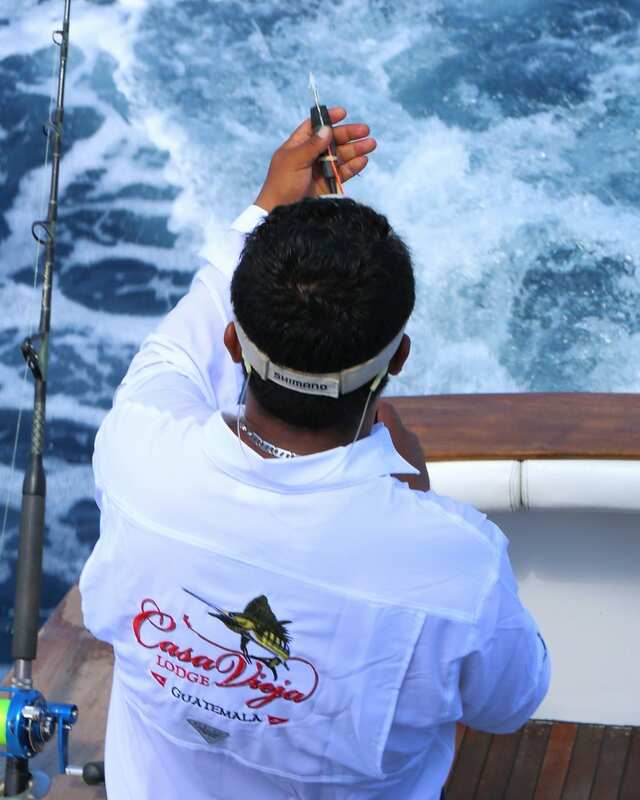 Casa Vieja Lodge’s sponsorship allows TBF to much more while also expanding its tagging education and outreach efforts. 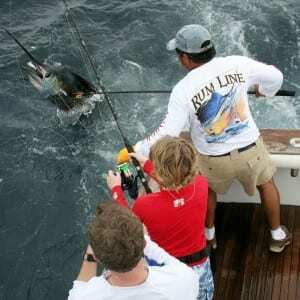 To learn more about The Billfish Foundation please visit www.billfish.org. 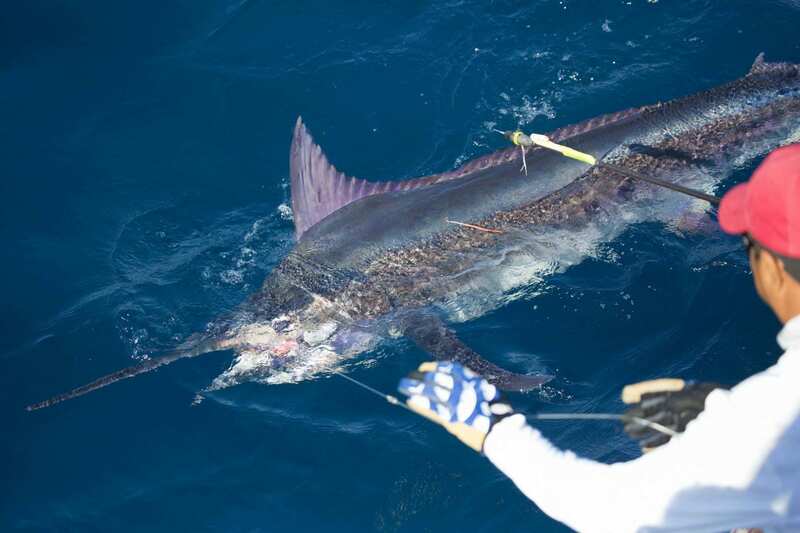 So you want to Tag Billfish on your next trip? Notify your booking agent or Lodge Manager that you would like to purchase Tags prior the day you fish. We will handle all paperwork and will register your releases for you! The success of TBF’s Tag and Release Program is dependent on dedicated anglers like you who support and believe in conservation efforts. Casa Vieja Lodge has been a long time supporter of the Central American Billfish Research Initiative at the University of Miami Rosenstiel School of Marine and Atmospheric Science. The Initiative has the purpose of generating the science needed to promote billfish conservation in the region. Under an ecosystem-wide approach to study and understand exploited billfish population dynamics in the eastern tropical Pacific Ocean off Central America, Rosenstiel School scientists headed by Dr. Nelson Ehrhardt and Dr. Mark Fitchett, and students Bruce Pohlot and Julie Brown have made significant discoveries about the role of oceanic features on billfish seasonal habitat use, spatial interactions with commercial gear, status of population exploitation of the billfish stocks and on the economics of recreational fisheries. On January 29th, 2015 Casa Vieja Lodge helped sponsor a billfish conference delivered by Dr. Ehrhardt at the Club Náutico in Guatemala City. The highly specialized research results delivered at the conference were welcome by a numerous audience that included Government Authorities, Naval Forces, members of the newly established Sailfish Conservation Commission, stakeholders, members of the Club Náutico, and members of local universities. 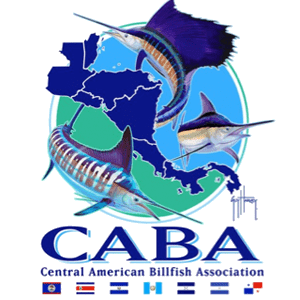 Funding for this large billfish research initiative has been provided by the Central American Billfish Association (CABA), the University of Miami and several private donors. The most salient results at the conference were the high seasonal dynamics of ocean fronts, the significant seasonal surfacing of low dissolved Oxygen sea water, and eddy formations off Guatemala all influencing billfish catch. Such features were said to be the seasonal physical mechanisms that concentrate baitfish at the surface, thus facilitating the presence of top predators such as tunas and billfish and influencing billfish habitat use in the presence of prey. 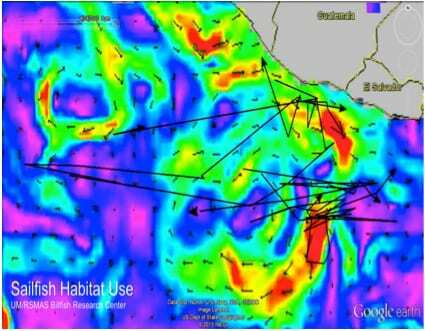 Equally important were the maps showing the vast nature of sailfish migrations relative to the avoidance of areas with low dissolved Oxygen off Nicaragua and the Gulf of Tehuantepec and their notorious presence in areas off Guatemala and Costa Rica. 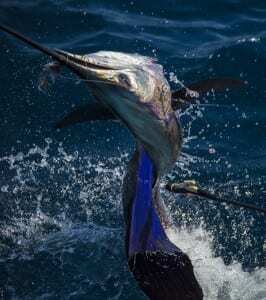 Of concern to stakeholders was the excessively high level of fishing mortality exerted on the sailfish stock by coastal and high seas longliners as well as tuna purse seiners. The later were shown to operate in numerous amounts in an area in western Guatemala and southeastern Mexico. Those areas coincide with the deepest position of the 1 mL/L of dissolved Oxygen in the region. Such level was indicated as the minimum amount of dissolved Oxygen that prey species for the tunas and billfish need for survival in the water column; therefore, the areas were identified as preferred habitat by prey and justify the presence of top predators. 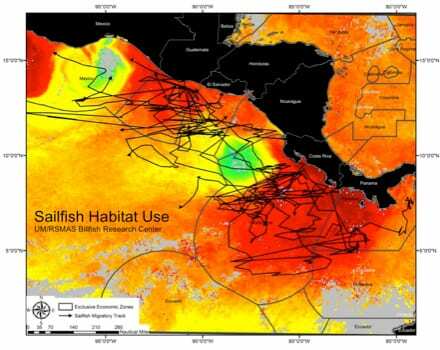 Figure showing the preference of sailfish for eddy formations off Guatemala.